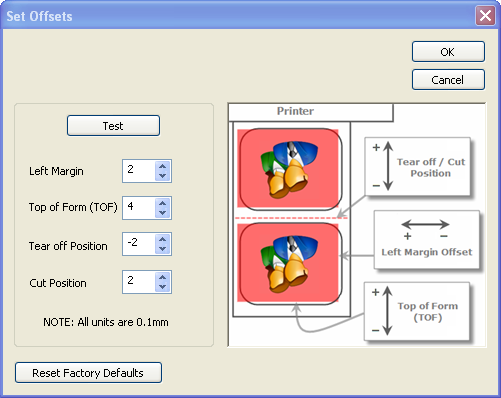 Overbleeding forces the printer to print beyond the edges of your label to compensate for the printer not accurately placing the images on the label. 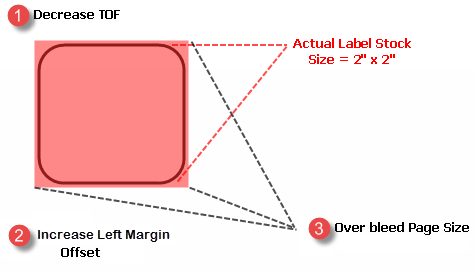 The printer has a small margin for error (Approximately +/- 0.5mm) when it comes to placing an image on the label. Page Size. If you are using BarTender, simply change the size under the File Menu - Page Setup. If you are using other graphics programs you will need to change the page size in the application and in the printer driver preferences. Increase the page size width in the driver preferences by .03 inches (0.8mm). Increase the height by .03 inches (0.8mm). Note: If you find that too much ink is printed on the liner you may choose to overbleed by lesser amounts. The TOF and Left Margin Offset changes below would need to be adjusted accordingly. Left Margin Offset. Decrease the Left margin offset by half the increase of the page size width. In this case you would increase the value by 4 (0.4mm). This will center the page size increase so there is a .015 inch over bleed on both left and right sides. Some additional adjustment may be necessary depending on whether the image was perfectly aligned before. TOF. Decrease the Top of form by 4 (0.4mm). This will cause the printer to start printing before the label and ensure a fully printed label. Some additional adjustment may be necessary depending on whether the image was perfectly aligned before. Note: It is best to over bleed as little as possible to avoid excess ink on the label backing. Also, over bleeding too much will cause the printer to skip labels. This is because the printer stops printing too late to sense the next label. Labels are printing horizontally offset (left to right) on the LX800. The image is printing too far to the left or right. Labels are printing vertically offset. The LX800 starts printing in the middle of a label. It is skipping labels between prints.